This typically-Tuscan property composed of a luxurious villa with swimming pool and a farm is for sale in Siena's stunning countryside. This complex, located at approximately 3 kilometers from Siena's famous Piazza del Campo, can be reached from a convenient paved road connected to a dirt road leading to this old renovated farmhouse, which is in an extremely panoramic position overlooking the countryside and with a view of the city and its main monuments. This estate is composed of two elegant and comfortable residential units which measure 500 m2 overall. The property's garden measures approximately one hectare and is home to a swimming pool that fully enjoys the privacy and beauty offered by this setting surrounded by nature. The park is adorned with approximately 150 centuries-old olive trees. The main villa features a spacious hall with panoramic windows, a dining room and a big kitchen on the ground floor, while the first floor is home to four bedrooms. There are also four bathrooms, a cellar and some storage rooms. The second building features a lovely Winter garden on the ground floor, a double-sized hall, and a kitchen; there are four bedrooms on the upper floor, together with three bathrooms, a cellar and some storage rooms. The grounds measure over 20 hectares and include various crops, including a stunning eight-hectare olive grove, a fruit orchard with apple, plum and cherry trees, a vegetable patch and a forest. There are also two agricultural buildings and a garage adjacent to the residential part of this complex. In this genuinely rural context, this villa for sale in Siena's countryside is perfect for those who love the relaxed atmosphere offered by the countryside, while still being close to towns and their services. Siena is a famous city in the heart of Tuscany and is one of the most popular and loved destinations in the Region. World famous for its huge artistic, cultural, scenic and historic heritage, Siena is also famous for its Palio, which is a horserace run through Piazza del Campo. In 1995 the historic centre of Siena was named a UNESCO World Heritage Site. There are various religious and civilian buildings of great interest here. There are indeed many luxury villas and period estates in the territory of Siena: some are located in the city centre and in the nearby villages of the Chianti Region; they are ideal places where luxury joins the warmth of family. These areas are perfect for all those who wish to have beauty and luxury without sacrificing the peacefulness you can enjoy in these lands. This elegant Tuscan villa for sale in a quiet location, positioned on top of a hill with a splendid view over the surrounding valley. Villa for sale near Arezzo in the heart of the Valdichiana. The luxury property has a surface of 1.760 m2, dates back to the XVI century and is surrounded by a beautiful park of 9.300 m2. 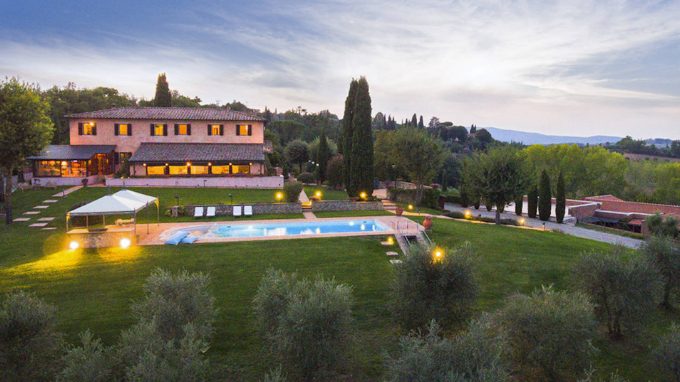 In the wonderful context offered by the countryside a few kilometers from Florence, there is this luxury villa for sale. This 17th century villa, located on the hills near Pisa is for sale. Elegantly restored during the 1900’s, it offers a spectacular view.